Its always encouraging to see great recent inventions come out to market. One of the excuses people often give to lack of innovation is the argument: "everything has already been invented". This list of some of the best and most interesting inventions that came out in 2011, should give hope to any budding entrepreneur. You can always come up with new concepts, minor tweaks or improvement that will result a the next big invention. read the stories behind these inventions, you never know, they might ignite the inventive spark in you! Have you ever driven in your car with the sun shining directly in front of you? If you have, you know that disturbing, unsafe and frankly annoying feeling – you just cannot see the road ahead. Wearing sunglasses doesn't really help – if the strong glare of a near direct sunlight is in front of you, it’s very hard to see anything. 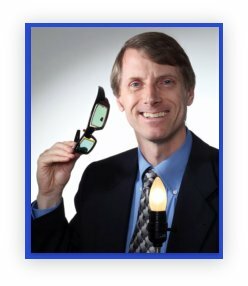 For Chris Mullin, that was the instigation for the invention of DynamicEye – a pair of LCD sunglasses that dynamically blocks any glare from direct sunlight. The glasses work by using a black square of pixels that appears on LCD lenses, and tracks the sun. It works at any angle, even if the wearer is on the move, blocking only direct sunshine glare and keeping the rest of the lens lightly tinted and the surroundings visible. The invention is not yet ready to go on stores shelves but you can read more on the dynamic eye electronic sunglasses, how they work, how they came to be and Chris Mullin’s inventor story here. What’s cooler and more fun than a body board? A body board with an engine! The Kymera motorized body board, a jet-powered body board, light enough to carry under your arm, efficient enough to run for a full day without guzzling down expensive fuel and small enough to fit into the trunk of an average car, is the brain child of inventor Jason Woods. His inspiration? He used to own his own old ski boat, to use at the lake near his house, but soon had to part ways with it, since carrying, transporting and using it, became too much of an expense and a major hassle. It guzzled fuel, needed a truck to transport and in general, became more trouble than joy. Once he sold it though, he found himself sitting by the lake with no fun way to go on the water, like he wanted to. Looking around, he realised he wasn’t alone. You either had the crowd with the big expensive watercrafts enjoying the water, or ordinary people, on the beach observing with envy. His new invention, the kymerajet, aimes to bridge the gap. At only 35 pounds in weight, and around 10$ in gasoline, to keep it powered for a full day, and with the intention to sell it for roughly the price of a high end gas powered scooter, it would potentially allow anyone to carry a motorised watercraft with them, use, enjoy and bring home, hassle free. Much like you would use a bike. Walk and ride. Jason Woods is also working on a solar powered version that will cost nothing at all to run, and pitching is product as a tool for water emergency rescue personnel. Read more about Jason woods inventor’s story of the kymerajet, here. Much like its name suggests, the print brush is a printer that acts as a paint brush. You swipe the small hand-held printer over almost any flat surface such as plastic, wood, fabric or walls and it immediately prints over it, in less than 10 seconds. The paint brush uses a new technology called random movement printing technology (RMPT), which is similar to computer mouse optics combined with a navigation software and inkjets. Using lasers, this gadget takes into account a user’s hand movements, rotation and speed and allows for printing that is not constrained by the size of the paper. The PrintBrush weighs about 8.8 ounces and has a digital camera incorporated into it, to allow for direct photo-taking that can be immediately printed and a Wifi, Bluetooth and infrared connections so that you can literally print any digital image from your laptop, a SMS or internet content. The concept was first conceived by the PrintBrush’s inventor, Alex Breton, an engineer from Stockholm, in 2000 and is predicted to be in stores sometimes next year. Read more about the PrintBrush and Alex Breton, its inventor. Though it seems this latest invention comes straight out of a Robocop movie, the BodyGuard, an armour sleeve meant to be worn by cops, soldiers and security personnel could well be worn by your neighborhood police in the next few years. 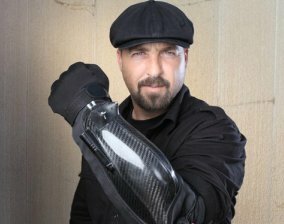 The BodyGuard, meant to deter suspects from engaging in potential violent confrontations with the law, is a sleeve or an extended glove, made from ballistic nylon, and worn on the forearm of a law officer. Equipped with a stunner, a video camera, a flashlight and a laser pointer, it will allow police officers to raise their hand, aim at their target and send a high voltage hit straight at their chest, while filming the whole ordeal. The idea – the camera, the laser identification which lets a criminal know he is within target, and the frightening high voltage about to hit them, will convince an aggressive opponent to surrender rather than engage in a violent interaction they are sure to lose. It’s all about preventing a confrontation, before actual weapons are brought out, empowering officers and saving lives. Sounds like something out of a movie? It isn’t. The bodyguard has already been tested by the US justice department in their annual training and technology testing event: the mock prison riot.A demo unit will also soon be tested by the Los Angeles police department. This invention does have a connection to the movies, though – one of its investors, is no other than Kevin Costner, of ‘Body Guard’ fame– the movie that is, not the invention.